ANAGENIC is a unique, absorbing melange of found, synthetic, natural and musical sounds. Wiggins compiled, sorted and analyzed these sounds by computer for over a year. The result is a varied, ever-changing, humorous electronic composition that will leave the listener amused and touched. The superb Belgium magazine OPEN SYSTEM PROJECT described ANAGENIC as, "une superbe organisation musicale ou tous les sons s'entremettent l'un l'autre dans une genese relationelle etonnament coherente parce qu'analogique. D'ou le titre, Anagenic". A very funny, very intelligent collage by this New Yorker who works as Supervising Sound Editor at HBO. This archival issue of Anagenic is presented with the permission of John Wiggins. 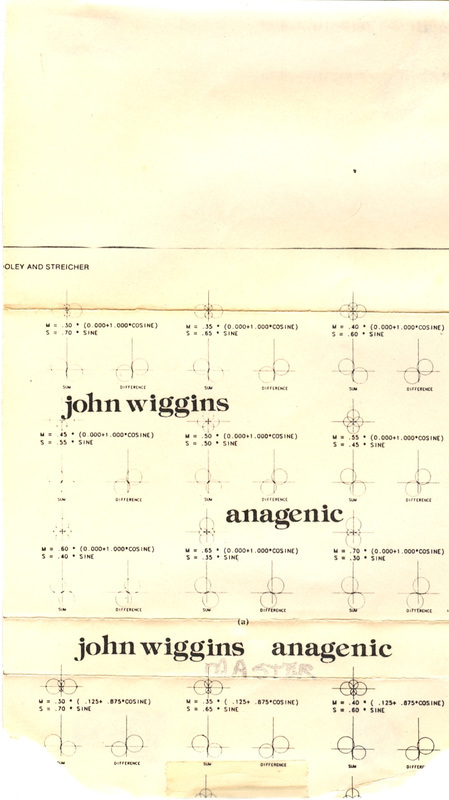 Anagenic by John Wiggins was listed in the January 1985 and May 1985 Cause And Effect Cassette Distribution catalogs. These recordings are straight transcriptions from an original copy of the cassette as it was published by John Wiggins in 1984. No attempt has been made to enhance or "improve" the sound quality.